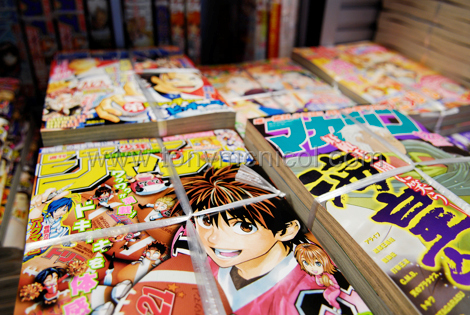 Where is Tokyo’s biggest manga shop? Earlier this week I was taking photos in Ikebukuro for a story on manga. I asked around to try and find Tokyo’s largest manga shop but drew a complete blank. Shops seem to specialize in one particular demographic or sell second hand books. Anyway, for what it’s worth, here is a short list of shops I did find. Anyone got other recommendations? Village Vanguard. A chain from Aichi-prefecture. I’ve only been to the one in Shimokitazawa, Tokyo. It’s really an Aladdin’s cave with CDs, clothes, imported knick-knacks etc too. The manga is a mixture of current best-sellers, old classic and off-beat Garo type stuff. Animate Ikebukuro. This is on “Otome Road” by sunshine city, the female otaku mecca. Several floors of manga, with a slant towards manga for girls. K-Books Ikebukuro. Another shop on Otome Road. There are several separate stores dotted round that area. Kinokuniya (Shinjuku) Pretty good selection of manga in English. Expect to pay a lot more for English manga than Japanese. There must be more ???? Mandarake. Their biggest shop is in Nakano. They have huge range of manga, all second-hand. it’s in Nakano broadway which was otaku central while Akihabara was still selling radios. Book Off . A chain of second book stores. EVERYWHERE in Japan and dirt cheap. Older or slightly tatty manga often goes for 105 yen. This entry was posted on Thursday, November 13th, 2008 at 10:24 pm. It is filed under manga, my photos, travel and tagged with manga. You can follow any responses to this entry through the RSS 2.0 feed. amazon.co.jp ought to have a fair selection! Not sure, I’m afraid. But its a huge place – so probably!